Vicki here sharing my last Tutti creation for October. Hard to believe that November is just around the corner...and Tutti Designs has just released ten new stained glass panel dies this past week! A must have from the Tutti Designs Store. 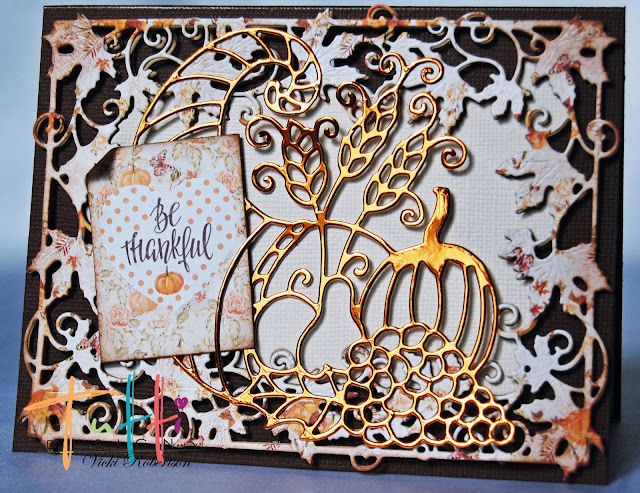 I've used the Cornucopia from the August 2017 release and the Maple Vine Frame from the July 2016 release on this project. They work so well together for this time of year! The bitter chocolate card base is A2 size and perfect for the vine frame. The Cornucopia is cut from bronze metallic. 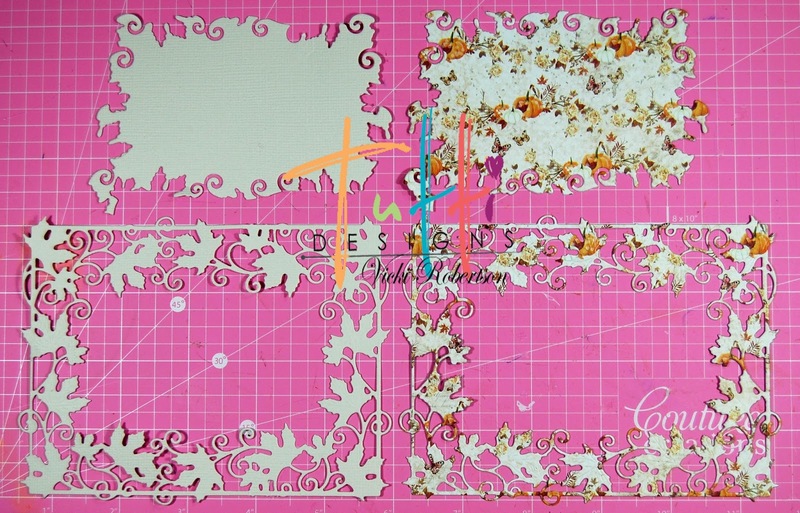 In place of a stamped sentiment, I used a tag that was included with the Amber Moon pattern paper collection. 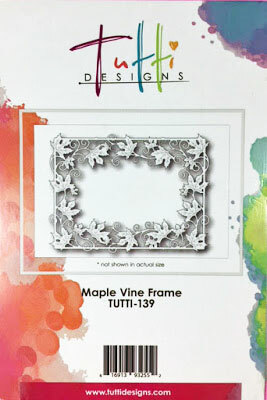 The Maple Vine Frame was die cut three times. One each from patterned paper, kraft and eggshell cardstock. 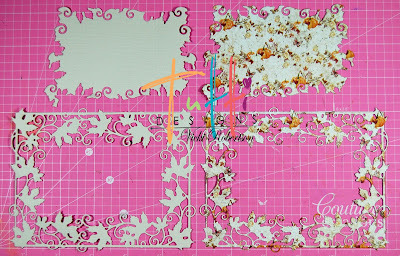 I used the kraft frame as a shadow effect for the patterned frame by giving it dimension with foam tape. I switched out the negative cut areas in the center of the eggshell and patterned frame. This worked better as the background for the Cornucopia. This angle gives a better view of the dimension. I adhered the metallic Cornucopia to the frame and tucked the tag into it. And there you have it...a simple, but elegant card to give this season of Thanksgiving. Love the bronze metallic with the chocolate card stock! 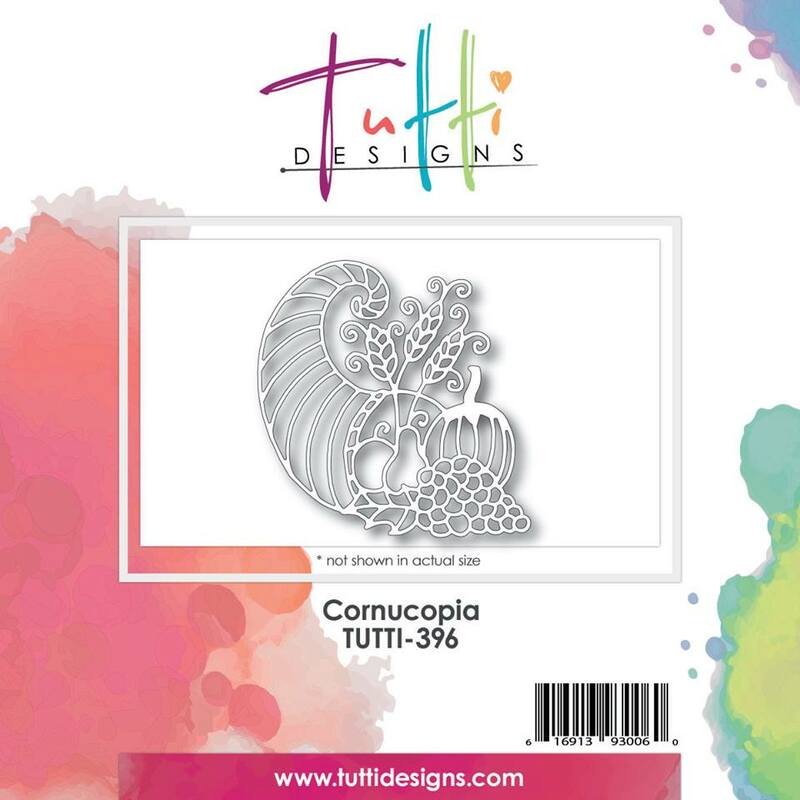 That cornucopia die is such a perfect Fall cut, so pretty and delicate! Just gorgeous Vicki and I love how you've tucked that little sentiment panel in there! 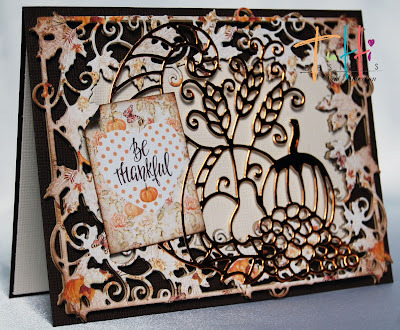 Fabulous inspiration combining dies!